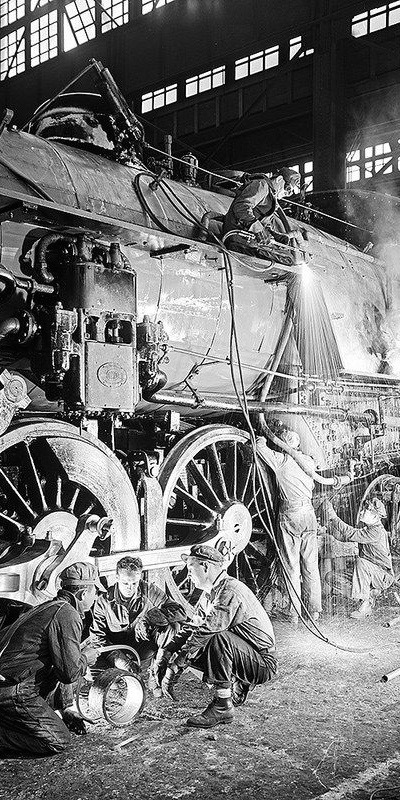 One of the most exciting aspects about the people that work on the railroads is how much they enjoy their work. Our crew works well together as a team with one goal in mind: to build you a high quality, reliable railroad. We have a number of qualified associates on our work crew, and each person has a niche or specialty in which they take pride. We also subcontract a vast number of qualified specialty model railroad businesses that work with our crew, making sure you get a high quilfied model railroad. Kimberly Lamb She is the assistant project manager and helps in organizing and ordering the products for your project. She specializes in structures and landscape scenery. She can assemble kits in all scales, and enjoys making trees, rock castings, and painting/weathering. Scott Perreault is our "Super Scenery Guy". He has developed a reputation for realistic model railroad scenery. He designs all the scenery for our layouts. Jonathan Lamb specializes in landscape scenery. He can assemble kits in all scales, and enjoys making trees, rock castings, and painting/weathering. He also works on track, wiring and DCC programming. Amos "Ace" Cutter has developed a reputation for realistic model railroad operation. He started with N-scale and now has a very large HO-scale layout. He is also featured in "Great Model Railroads 2006"! Robert Wall specializes in landscape scenery. He can assemble kits in all scales, and enjoys making trees, rock castings, and painting/weathering. He also works on track, wiring and DCC programming. Also was the president of the North Shore Model Railroad Club. John Sullivan specializes in landscape, water & ocean scenes. John takes great pride in his work and has won several craftsman awards for his abilities and creativity in a variety of different scales. Matt Callahan specializes in brass locomotive custom painting. His work as a brass painter has earned the respect of a number of brass manufacturers, including Overland Models! Mark Marston is a skilled modeler in wood structures, but his real skill is as a professional cabinet designer and builder. His talent will finish the look of your railroad, and will make the side profile and underside of your layout look as good as the detail trackside! Gary Paulino has a great reputation in computer and digital control systems. His specialty is working with DCC systems, such as MTH DCS, Digitrax, NCE, and Lenz. Gary is also the owner of TrainTek LLC..
Carlton Rohmer has a talent for wiring layouts, installing decoders and sound systems. He is also great at trackwork of all scales. He also is a authorize Lionel and MTH repairman. Colin Rockwood has a talent for wiring layouts, computer controlled systems. Shawn Cavaretta has over the past few years been focusing on creating quality custom laser cut wood models in, HO, N, S, & O scales. Shawn is also the owner of Minuteman Scale Models. Harry Dente is our custom structure builder. He specializes in kit-bashing and detailing freight cars and engines. He is an expert N-scaler. Stuart Gralnik is our custom structure builder. He specializes in O-scale custom model making and interior detailing. He is an expert O-scaler. Stu is also the owner of Model Building Services. Scott Mason is an award-winning expert in craftsman custom structures. He's the host of Scotty Mason Live podcasts and his website is www.scottymason.com. Ralph Williams has a great reputation in garden design and builds Garden Railways of any size, especially suited to your yard. His specialty is G scale wooden structures. Ralph is also the owner of Trains and Trees. Dave Laughridge Known as "Dr. Tinker" has a great reputation in classic O scale repairs and even wrote the book on Lionel repairs! Dave is also the owner of Dr. Tinker Trains website. Gerry Rooks was the former owner on Maine Trains hobby store, and he has a great reputation in HO & N scale repairs. Plus he does decoder programing and installations.